Making your house smell like the holidays does NOT mean you have to use toxic scented candles or room air fresheners. Most, if not all, of the room scenting candles and sprays are filled with chemicals that are very harmful for your body. The end does not justify the means. If you want your house to smell like the holidays, use all natural ingredients! I’ve put together a number of Holiday Essential Oil Diffuser Recipes to make your life healthier and easier. 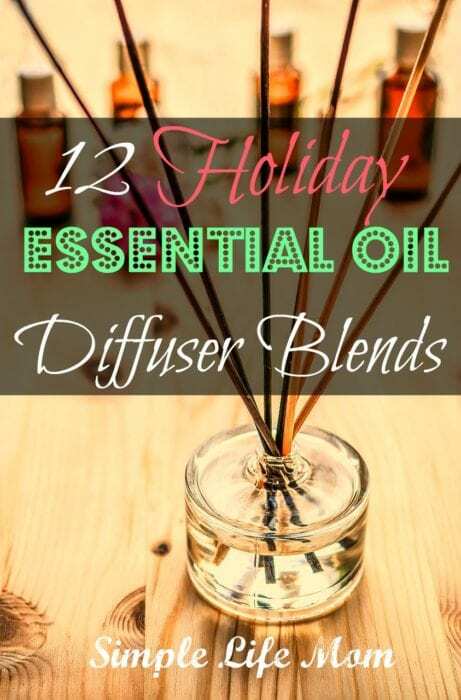 These Holiday Essential Oil Diffuser Recipes vary so that you can choose what smells like the holidays to you. For some people, vanilla reminds them of making cookies with their family, while others may get excited at the scent of a fresh tree. I enjoy the cinnamon clove scents that remind me of apple ciders and orange and lemon that make me think of freshly baked sweet breads. If you don’t have a diffuser, you still have options. 1. Saucepan: Place 4 cups of water in a saucepan and bring to a simmer. Place the drops recommended into the pot and allow to simmer. Obviously, you need to check it to make sure you don’t run out of water. 2. Plug in or Tea Candle: I had a candle with a dish above it for years before I started using essential oils (like this). I then realized that I could place a little bit of water in the dish with a few drops of essential oil and light the candle underneath it. I now have a few different kinds of diffusers, one being a plug in “night light” type light with a dish above it (like this). I will use this in certain rooms, again with the water and essential oil in the dish. 3. Reed Diffuser: Reed diffusers have never been enough for me. I like to turn something on and smell it instantly, then turn it off and be done when I’m finished. Reed diffusers are excellent for long term use. They are easy to use, cheap, and are pretty as well. Find one HERE. 3. An Essential Oil Diffuser: These can range in price from $15 to $150 or more. In my experience, the cheaper ones work just as well as the expensive ones, though perhaps for not as long before something breaks. If you’re looking for one, don’t be afraid to try a cheaper diffuser like this one, or even THESE. You can even get one for your Car! Or make your own (learn how by clicking here). Try a combination that sounds good. If you really like it, then write that down. Consider multiplying the drops to store in a 15ml glass bottle so you have it ready when you want it. I’ve given you a one time use amount in each of these recipes. 15ml can generally fit around 300 drops. When creating an aromatherapy blend, your scent receptors can only take so much and good essential oils are often expensive so there’s no reason to waste them. If you make a larger batch, use only 5-6 drops in your diffuser. Starwest Botanicals are 3rd party tested and wonderfiul pure oils. Bulk Apothecary are also well tested and loved (better on the budget as well). If you are looking for more, try Mountain Rose Herbs. They are another reputable and fabulous company. These are all blends that I love to use, depending on the occasion and my mood. Don’t forget that essential oils diffused in the air can also help to kill bacteria and viruses. I have an essential oil blend for the Cold and Flu in my shop. Thank you so much for this list. I am diffusing more and more to help my home stay fresh and great smelling….tiny crock pots are great for diffusing essential oils and/or actual ingredients for aromatherapy. I bought 5 tiny crockpots at Goodwill (thrift store) and will put cinnamon sticks, cloves, orange peels, fresh or dried herbs, etc in them, fill with water and plug in. It works great. You could also put Essential Oils into them and fill with water. Just be sure to check them after several hours and refill with water. Thanks again. I’ll be sending some of these made up to my daughters for their birthdays: January 10 & 5…Yup. Just after Christmas! Mine is Dec. 26th!! !